I made a quilt a few years ago that I made from one of her patterns in this book. I ordered it from her site and was surprised how quickly I received it. 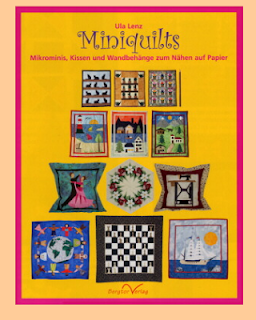 It features miniquilts but I was wanting to make the 'It's a small small world' quilt that is shown on the front cover in a size for a baby blanket. I enlarged the patterns and adding a row of hearts to the top and bottom to make it a rectangle and this is how it turned out. It is like my Opus Magnum of all that I have created. I gifted it to a special friend I work with and I would love to make another just as a wall hanging for my own personal enjoyment but Iknow I probably will never do it. I don't know why but I hate making the same quilt twice. The thrill of seeing it come to life is gone the second time around...at least for me. Another co-worker has offered to have me make this quilt for his child and he will buy it, but what would one put as a price on something like this. I don't think whatever it would be, would be enough to get me to do it again and give it away (paid or not) if I were to make it again I would want to keep it. I have always loved the It's a small, small world theme since I was a young girl and had a collection of international dolls that I wish I still had but alas I do not. Your Small World is just fabulous. I love your children you designed. I can't wait to see your castle!